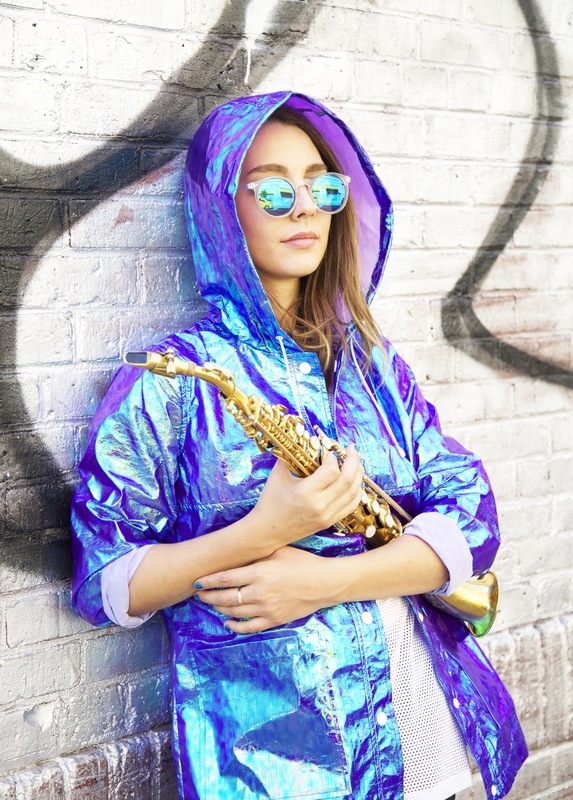 Vol.1-Inter-be marks the debut of Mae.Sun, a New York-based eclectic group led by the clear-pitched soprano saxophonist Hailey Niswanger, a Berklee-graduate who makes a bold move here in comparison with her previous three albums as a leader. The adroit sextet, whose other members include vibraphonist Nikara Warren, guitarist Andrew Renfroe, keyboardist Axel Laugart, bassist Aaron Liao, and drummer David Frazier Jr., stacks up engaging sonic layers with a foot in the contemporary jazz and the other in a groove-oriented receptacle that encompasses funk, electronica, and neo-soul. “River of Perception”, a progressive 6/8 adventure, immediately catches our ear when Niswanger’s adventurous patterns jump on top of a groovy bass line that articulates with a cadenced melodic ostinato and a wholehearted pulse. The mood is modified when the spotlight is given to Renfroe’s distorted guitar, whose wry remarks never calls the energetic balance into question. After elevating the human spirit throughout this intense ride, the band decelerates for the finale. “Continuous Recognition” blends an occasionally-syncopated funky backbeat with an unfaltering yet laid-back bass groove, and an atmospheric organ-driven bliss to create a voguish foundation. The bandleader creates melodic figures with an effect pedal, bending and shaping angles and curves at her own will. Both meditative, “Breathe” and “Be Love, Be Peace” feature Niswanger’s soaring vocals. The former, regulated by a dashing 5/4 meter, dips acoustic sounds and penetrating vibes in wooly sonic textures, while the latter moves surrounded by a glamorous electronic-style aura, featuring an utterly expressive solo by Renfroe and, closer to the final, the usual inside/outside prowess by the saxophonist. An African folk groove enriched with wha-wha infusions, vibraphone melodic inspiration, and eccentric soprano drives are the keys to turning “Life is Limitless” in an elated celebration. This rapture is disintegrated, giving its place to a radiant spirituality, when the following track, “Universal Harmony”, begins to spin. This tranquil prayer, a true moment of inspiration, acquires further elasticity when the drummer reinforces the triplex kinesis reserved for the improvisations. The advanced percussive skills of Frazier Jr. are also noticeable on “Investigation of Reality”, an immersive experience populated with syncopated, fraught backbeats, and full-toned bass drones. Wielding a strong sense of composition, unity, and structure, Mae.Sun brings convincing doses of originality attached to its genre-bending routines. Give it a few listenings and let the fresh fusion reward you.